L-R Massimiliano Pogliani, Christopher Shannon, Caroline Rush and Dylan Jones. 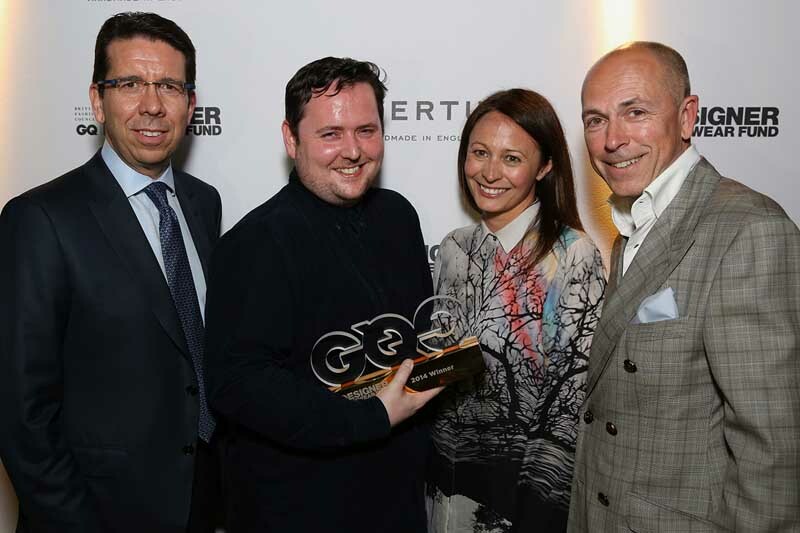 LONDON, Jun 9, 2014/ — For the inaugural BFC/GQ Designer Menswear Fund supported by Vertu, Central Saint Martin graduate Christopher Shannon has been named the winner of the £150,000 cash grant and £50,000 value in kind services. Established in September 2013, the BFC/GQ Designer Menswear Fund provides one designer with £150,000 grant to provide necessary infrastructure to take them to the next stage of their business and £50,000 value in kind services, including a bespoke, high level mentoring support programme over a twelve month period. “While the competition was tough, Christopher Shannon’s win attests to the very bright future of British menswear, demonstrating original flair, meticulous craftsmanship and an in-depth commercial understanding. These ingredients, combined with this fantastic prize, will see this business sit confidently on the global stage,” Mr. Jones added.